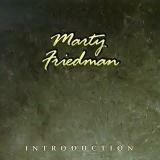 After the artistic leap into the unknown with Scenes, Marty Friedman continued two years later with a similar direction on Introduction. The keyboards-n-acoustic-guitars base was amplified by cello, violin and additional orchestration to make the album slightly more grandiose than its predecessor. Beyond the atmospheric keys, pianos are also given a much bigger role in carrying the melodies. Although Scenes had it’s dark moments, it was overall a pretty upbeat, shall we say optimistic album, especially with the soaring lead guitar melodies. In this sense, Introduction is much like its brooding, moodier counterpart. While early tunes like Arrival (LOVE that piano-melody in the end) and Be are filled with electric guitar leads of the aforementioned stylings (and again, very little shred to be found anywhere – just tasty, soulful leads), the record goes down a darker path starting with the 9-minute Escapism, which almost reaches movie score-like vibes at the most epic peaks. There’s no orchestra to create this feeling, but with the elements available, Friedman has made a helluva tune. The only spoken words are again in Japanese, coming in fairly audibly on Luna. It remains to be guessed if it’s a coincidence that the only words spoken on both Scenes and Introduction are on the fifth track. Despite the audible oriental influence, I’d say Friedman has somewhat downplayed his Japan-fandom in the melodies and brought in a different eastern theme – a Slavic, Russian vibe. It's subtle and maybe I’m just mislead by the title of the final track, Siberia, but I can’t deny the vibe. Speaking of Siberia, it’s a very interesting choice to close the album with. Unlike Triumph on Scenes, which lives up to its name of being a sonic embodiment of victory and a superb feeling atop some mountain, Siberia closes this album with a very ominous, even fatal atmosphere that makes you think you’re just scaling said mountain and as you see a rock slide coming down towards you, the album stops. That’s pretty much the feeling I get from this whole album. While Scenes was a light-filled album with dark moments, Introduction is a dark album with light-filled moments. It’s more versatile in scope and instrumentation, which shows that Friedman was getting comfortable with his experimental leanings and was really flexing and challenging his abilities. The only clearly mentionable point that Introduction loses to Scenes is that it simply doesn’t have the element of surprise on its side. Scenes showed a new side of Marty Friedman which totally took me off guard and he merely takes it further on this one. Still, Introduction is one of the finest instrumental rock records I’ve ever heard and totally worth your time.